Having the tonsils out for young kids is not so fun – and it sure ain’t fun for the parents either. This post is about how to bring out all your parenting skills, there’s no one who knows your kid better than you–so you are the most needed component in your kid’s recovery. Fast forward to two days after the surgery, at 1am Ben wakes up crying. He’s in pain. He refuses to take any pain medicine, or drink anything, because he’s scared to swallow. After spending an hour comforting him and feeling helpless, he finally fell asleep. But I couldn’t. There must be something I can do to help him. ‘Minimizing pain for a toddler after tonsillectomy,’ I started Googling. Nothing. Or at least nothing new. Turns out there’s no specific answer to this. Every doctor has a different opinion and every case is different. I even tried to search in Hebrew, to see if there’re any secrets that were passed through generations of Jewish moms. Nothing. The bad news is – If your child is going through a tonsillectomy the only thing you can do is try to give them pain meds. And if they don’t want to swallow – use suppositories. And from my experience, suppositories aren’t great, but better than nothing, I guess. But one of the most difficult – and heart-breaking – things about this is that at 2 and a half, your kid is not old enough to understand what’s going on. Here are a few things you can do. Some advice I received from my therapist that really worked was ‘mental preparation’ for the hospital experience: A couple of days before the surgery I took a doll, “Ricki,” whom they haven’t played with for a while (to be honest, my kids never played with the doll, only I did). I put a band aid on Ricki’s throat and told the kids a story about Ricki, who had been sick a lot during the winter, and finally, one day, she went to the hospital because she wanted to feel better. She met a really nice Dr. who talked to her and then she went to sleep and when she woke up her throat was sore. Her dads gave her a lot of ice cream to eat, and after a few days she felt so much better and wasn’t sick anymore. When we got to the hospital I reminded Ben of the story, so he could more or less relate to it. It seemed to have made a difference. Even during the week, both kids mentioned Ricki, and we compared between her story and Ben’s. That was cute. 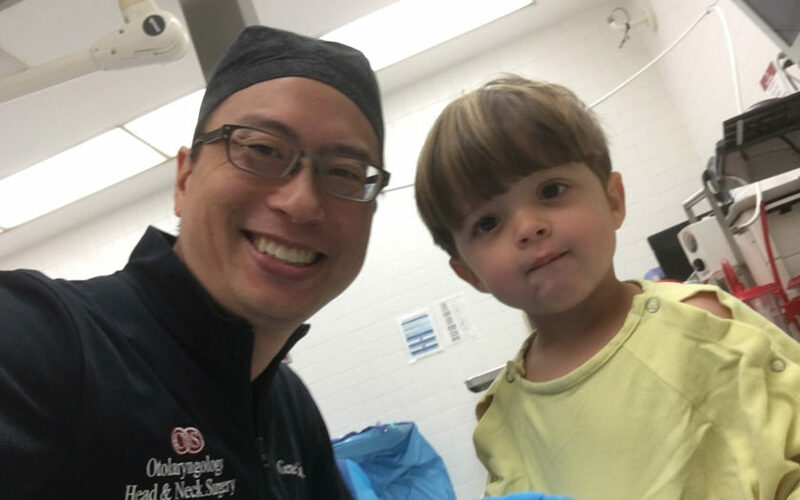 When the wonderful Dr. Liu explained to us what to expect he was pretty clear that it’s not going to be easy – only because at this age they don’t really understand what’s going on. Nevertheless, he felt that in our kid’s circumstances, it was better to do the surgery, even at so young an age, to prevent so many other issues. Dr. Liu said that as much as it would be difficult for the child, it ain’t going be cake for the parents as well. In fact, I remember him saying ‘the first week you’re going to feel like your parenting skills are being tested,’ and there’s nothing better to describe it (although my husband described it as “Your heart is being ripped out while your head is being bashed in”). All our creativity, patience, mental capability, everything we learned about Ben over the past 2.5 years was used to get through this week. After the surgery, there are two major things that can be of danger: fever going up (which indicates an infection) or bleeding. Otherwise, as far as I understand, it’s a ‘textbook recovery,’ which is what Ben had. Now let me explain what ‘Textbook recovery’ for a 2.5 year old looks like: First two nights – horror. The kid is crying, we try as much as we can to keep him from doing that so his blood pressure won’t go up (=higher risk of bleeding). We do everything, and I mean e v e r y t h i n g – to distract him from the pain. Keep him occupied, become a clown, a storyteller, a press-the-play-button on YouTube every two minutes, jump in high alert every time he opens his mouth like a President Trump on every starlet tweet about him. The next four nights is about 4 times waking up in the middle of the night. That’s really horrible too. And not because of waking up in the middle of the night, but because of the worst fear coming true: your kid suffers and there’s nothing you can do. After the first week, the waking up in the middle of the night start to subside. From four times it reduced to twice a night, and then once a night. After thirteen days, he slept through the night. 1.Try not to schedule a procedure like this in the winter – cold weather, and the chances of colds can really make everything tougher, not to mention effect the mood. 2. Use suppositories – we did Tylenol every four hours, it was really good especially during sleep. It made his sleep better. 3. Ask a family member to help out – if there’s someone in the family that your kid’s especially attached to invite them over for a few nights. Especially if you have other kids. It will help you if you split the time because it’s exhausting, especially mentally, and you’ll need to recharge. 4. Ask for the minimum amount of liquid the child should consume per day – this can be a real problem if you have small kids who don’t understand the consequences of not drinking (dehydration is common in these kind of treatments). The doctors, according to the kid’s weight, can tell you how much they should drink in a day to stay hydrated. Don’t forget to follow up on that and measure! (Ben, for example, drank nearly 20 oz through small syringes on the first day because he wouldn’t drink on his own). 5. Take a deep breath. It’s so hard. But it WILL be over in less than 2 weeks. It WILL. And you can always write to me for support!